In this new hidden camera prank show, celebrities are transformed by a team of special effects artists to go undercover as substitute teachers to surprise a class of unsuspecting students. BURBANK, Calif.--(BUSINESS WIRE)--Nickelodeon is unveiling a new content slate created for today’s kids who are multicultural, family-focused, and in control of their entertainment choices across platforms. With a foundation of supercharging its globally powerful original franchises like SpongeBob SquarePants, Teenage Mutant Ninja Turtles and PAW Patrol, and welcoming new, acquired properties into its ecosystem, Nickelodeon’s new slate represents a renewing of its commitment to serve all kids, through a multicultural lens; bringing in talent kids love from other platforms and formats; and opening up its demo to capture kid and parent co-viewing, to satisfy this generation’s demand for shared family time. The slate, announced today by Nickelodeon President Brian Robbins, was put into development in October at the beginning of Robbins’ tenure and will begin to debut on Nick’s platforms this summer. Nick’s new direction was developed against the network’s defining research insights into today’s kids, who: are the most diverse generation ever, with the fastest growing segment being Hispanics; who cite shared experiences with their parents and family as their top priority; and who are in near-total control of their entertainment choices, enabled by any one of the 12 connected devices found in today’s average household. Highlights of the new slate include: the return of Nick’s iconic All That sketch-comedy series, showcasing a whole new set of kids alongside members of the original cast, with Kenan Thompson serving as an executive producer; a reimagined version of Are You Smarter Than A 5th Grader, hosted by John Cena; an all-new unboxing adventure series starring Ryan of Ryan ToysReview, titled Ryan’s Mystery Playdate; America’s Most Musical Family (working title), a nationwide search and competition to crown the next big family musical act; The Casagrandes, the animated spinoff from The Loud House, featuring a multigenerational Mexican-American family; an untitled scripted music-based series set in a boarding school for the performing arts, produced by Simon Fuller and OneRepublic’s Ryan Tedder, and featuring original songs and performances in every episode; and ideas in development to spin off the characters from SpongeBob SquarePants into their own stand-alone series, specials and feature-length movies. The Casagrandes – Premiering in October, this companion to the animated hit The Loud House follows 11-year-old Ronnie Anne after she moves to the city with her older brother Bobby and her mom, where they now live with their big, loving and chaotic multigenerational Mexican-American family, the Casagrandes. Santiago of the Seas (formerly The Swashbuckling Adventures of Capitán Calavera) – This interactive animated series follows the adventures of 8-year-old Santiago Montes, a brave and kind-hearted pirate, and features a Spanish-language and Latino-Caribbean culture curriculum. The Dora the Explorer Theatrical Release – Paramount Pictures, Paramount Players and Nickelodeon Movies present in association with Walden Media the Dora the Explorer live-action movie, opening in theatres this August. Having spent most of her life exploring the jungle with her parents, nothing could prepare Dora (Isabela Moner) for her most dangerous adventure ever–high school. Always the explorer, Dora quickly finds herself leading Boots (her best friend, a monkey), Diego (Jeffrey Wahlberg), a mysterious jungle inhabitant (Eugenio Derbez), and a ragtag group of teens on a live-action adventure to save her parents (Eva Longoria, Michael Peña) and solve the impossible mystery behind a lost Inca civilization. 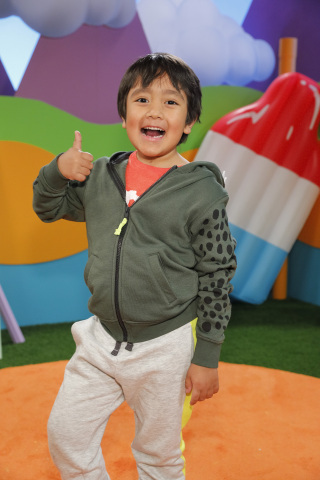 Ryan’s Mystery Playdate – Created and produced by pocket.watch, this brand-new live-action preschool series follows YouTube superstar Ryan, of Ryan ToysReview, his parents and animated friends Gus the Gummy Gator and Combo Panda as they work together to tackle a series of imaginative, physical challenges and unbox puzzles to reveal the identity of his mystery playdate. Simon Fuller/Ryan Tedder-Produced Untitled Project – A scripted music series set in a boarding performing arts high school, with original music in every episode. A nationwide search will be conducted to cast the show. Simon Fuller is a legendary, multi-hyphenate creator, producer and manager behind iconic franchises such as the global Idol phenomenon and Spice Girls. Grammy Award-winning Ryan Tedder is the frontman of OneRepublic and writer behind countless hit songs from artists ranging from Beyoncé and Adele, to Camila Cabello, Ed Sheeran and Kelly Clarkson, among others. Are You Smarter Than A 5th Grader – The iconic family game show will return with all-new episodes hosted by John Cena, who will also serve as an executive producer. Mark Burnett, Chairman of Worldwide Television, MGM (Survivor, The Voice) and Barry Poznick, President, Unscripted Television, MGM (Beat Shazam, The World's Best) will return as executive producers of the reboot, which places kids squarely in the center of the action. The series is slated to premiere this year. The Substitute – In this new hidden camera prank show, celebrities are transformed by a team of special effects artists to go undercover as substitute teachers to surprise a class of unsuspecting students. A $25,000 donation will be made to each school. The Substitute is produced by The Intellectual Property Corporation, and Eli Holzman and Aaron Saidman (Undercover Boss), with Mike Harney serving as showrunner. America’s Most Musical Family (working title) – This brand-new competition series, produced by The Intellectual Property Corporation, and Eli Holzman and Aaron Saidman (So You Think You Can Dance), follows the nationwide search for the most talented family in America. Are You Afraid of the Dark? – The beloved anthology series will return this October as a brand-new miniseries and follow new members of the Midnight Society as they gather around a campfire in the woods to share scary stories. The miniseries will coincide with the upcoming Are You Afraid of the Dark? theatrical movie from Paramount Pictures, Paramount Players’ and Nickelodeon Movies, in theaters October 2019. All That – Pop-culture phenomenon All That is returning for a new generation of kids. The new weekly sketch-comedy series will showcase an all-new cast of kids, with cast members through the years making special appearances during the season. Kenan Thompson (Saturday Night Live) and Kevin Kay (All That, SpongeBob SquarePants, Lip Sync Battle, Lip Sync Battle Shorties, Yellowstone) will executive produce, with comedian Jermaine Fowler (Super Donuts, Sorry to Bother You) serving as consulting producer on the series slated to premiere this summer. SpongeBob SquarePants – Nick is commemorating the 20th anniversary with the “Best Year Ever,” a tribute that includes an original one-hour special, “SpongeBob’s Big Birthday Blowout,” premiering Friday, July 12. Additionally, plans are in place to expand the SpongeBob SquarePants universe with spinoffs focused on the core characters into formats such as new series, specials and feature-length movies. The anniversary will culminate with the May 22, 2020 release of the new SpongeBob theatrical, It’s A Wonderful Sponge, from Paramount Pictures, Paramount Animation and Nickelodeon Movies. Rise of the Teenage Mutant Ninja Turtles – Season two of the 2D-animated series will premiere this fall, and follow the Turtles as they continue to hone their ninja skills, uncover new, powerful weapons and encounter a world beneath the streets of New York City. The franchise is also being expanded with an original, feature-length animated movie being produced by Nickelodeon Studios for Netflix. Blue’s Clues & You! – This remake of the groundbreaking, curriculum-driven interactive series Blue’s Clues brings back beloved puppy Blue for an all-new generation of preschoolers. Premiering in November, the series features all-new CG animation, updates to favorite characters and stars Broadway actor Joshua Dela Cruz as the new live-action host. Paddington (working title) – Actor Ben Whishaw (Paddington 1 & 2) will reprise his role as the beloved voice of the title character in the new CG-animated series, which follows a younger Paddington and his adventures in London with the Brown family and their friends. Paddington is a Heyday Films and STUDIOCANAL production in association with Copyrights, helmed by Adam Shaw of Blue Zoo (Go Jetters, Digby Dragon, Miffy, Q Pootle 5), and developed for television and written by Jon Foster and James Lamont (The Amazing World of Gumball, Cuckoo, Paddington 1 & 2). The series will be produced by multi-award-winning David Heyman (producer of all eight Harry Potter films, Gravity, Paddington 1 & 2), Karen Davidsen (formerly with Disney and HIT Entertainment) and Simon Quinn (Isle of Dogs, Fantastic Mr. Fox). Paddington is executive produced by Rosie Alison (Boy in the Striped Pyjamas, Paddington 1 & 2) and co-produced by Rob Silva. LEGO® CITY – The all-new high-stakes CG-animated comedy, created and produced by LEGO Group, depicts the funny, smart, and dynamic slices of life within the sprawling and diverse LEGO CITY community. Set to debut this year, the series follows the intertwining paths of the city's everyday heroes as they work together to stop a mysterious master criminal who begins to wreak havoc on their town.